Check out the top 8 reasons to take a test soak before purchasing a hot tub. There are some things you can only figure out with your shoes off! You wouldn’t buy a car without taking a test drive. So be sure to “Try before you Buy” a hot tub! Get wet!!! We’ve had hot tubs ready for test dips since our first day of business. 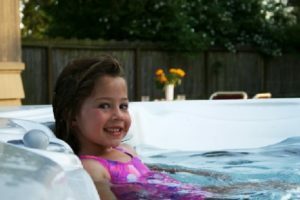 At Olympic Hot Tub Company, we believe that only by trying before you buy will you find the hot tub that best suits you and your family for a everyday relaxation and health. 1. Remember Goldilocks. You want a spa that’s just right. And, the only way to find it is to test it wet. Take a test soak to judge the space. Does the tub you’re considering have enough room for your family? Not too big; not too small! 2. Seating depth matters. Note the torso depth when you’re sitting up comfortably. In the Northwest, you’ll want the water depth to be over your shoulders so you can be warm & snuggy on rainy nights. 3. Don’t neglect your feet. Is there enough foot room in the foot well? Are there jets to massage your tired feet? 4. Select the best seat in the house. Multi-level seating should accommodate both adults and children. Make sure there are seats that fit everyone in your family. It’s important to test the lounge seat. Some people love them; others don’t because they float off. Make sure any lounge seats fit you and other family members. 5. It’s about the jets. Pay attention to jet types and jet placement. Most spa users prefer to adjust jet pressure for the hydrotherapy they’re seeking and most people prefer a variety of jets that hit their sore spots-like calf, wrist, shoulder and back jets. Check out the jet placement to see that they are focused on the spots where you need relief. 6. Hear the silence. A truly quiet spa like a Hot Spring has no audible noise when the water is circulating, heating and filtering. You don’t want any noise when it’s running not only for your own peace of mind, but that of your neighbors. You’re buying a spa for relaxation. Don’t add irritating noise that spoils your peace & quiet. 7. Take a deep breath and smell the water! Our showroom spas are set up with SilkBalance for the easiest water care and no smells. There’s no chlorine smell in a Hot Spring Spa with SilkBalance natural water care. Crystal clean water without effort or hassle should be your #1 concern. 8. Feel the water. Note how your skin feels after soaking. You’ll notice the difference with SilkBalance natural water care. Your skin will feel silky smooth with none of the dryness that results from soaking in chlorine and masses of other chemicals. Schedule a FREE test soak at any of our 5 Puget Sound area showrooms today! You bring the towels & suits. We have the tubs hot & ready when you are.
. Pleasure is serious business.